Went to The Local Vine Tuesday night with a couple friends for a $5 wine tasting of Australian wines. They are probably my most favorite wines. Shiraz's are probably my most favorite. There was a time when I hated red wines and only dranik whites, mostly Chardonnay. Now I'm pretty much the opposite. I don't even remember the last time I drank a white wine. $5 at The Local Vine gets you 3 tastes of wines. If you buy any bottles the $5 fee is waved. I bought a bottle of the 2003 Shingleback Cabernet Sauvignon. 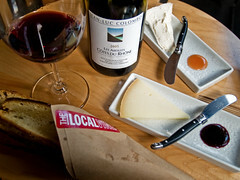 We stayed and shared a bottle of the 2005 Cotes du Rhone and a couple different cheeses. I would definitely go back. They have wine tastings every Tuesday. I would definitely go back.